Hannah Genders reports on her experience at Malvern Show. I’m just home from a wonderful time at the Malvern Spring Show and I must say the feature I was asked to host this year was the best thing I’ve ever done at a show. It was all about promoting people who are out there in the community, changing people’s lives in one way or another, around the subject of growing food. We built eight raised wooden beds and had a central “engagement” space with two chunky oak benches for visitors to the show to come and chat to the growers. Then each community group was invited to plant up the bed they had and tell the story of what they were doing. These groups ranged from Incredible Edibles Bristol, which I wrote about a couple of months ago, to a community orchard from Redditch and The Farming Sisters who have returned to run their family farm but turned it into a forest school farm – their passion is to teach children where their food comes from. The projects we invited were this diverse, and they all got on amazingly well and loved telling the visitors all about what they were doing. This inspirational lady is growing vegetables with adults with learning difficulties and people with mental health issues. The project is based at The Fold in Bransford, near Worcester, and the incredibly high quality food they produce is sold on to shops and cafés in the area. A first at Malvern, the show gave us this tepee to do all our interviews in and it was the best chillout place on the showground. 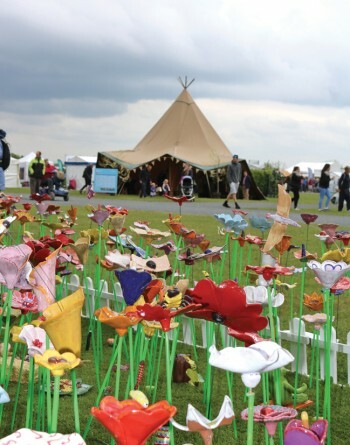 This was just across the way from us, a fabulous meadow of ceramic flowers made by a whole community in Sandwell from aged four to eighty-four. My son, Tom Genders, who popped up in last month’s “10 Years Ago in The Village” feature. He is still painting and was invited by the show to be their resident artist, going on the gardens and painting them. I’m a proud mother. A first show garden for Tim, an artist and a gardener who wants to move more into garden design. He created a wonderful tree that moved through the very planed wood of the frame, beautifully set off with the hills behind. Created by Peter Dowle, well known to us in the garden world for his creations at both Malvern and Chelsea. He has built more than 30 show gardens; this year’s was the best ever and deservedly won Gold and Best in Show. The photo I took is just him – suit and wellies! Malvern is the best show to buy plants: it’s early in the season, attracts the top nurseries in the country and they usually sell out during the show. This year’s floral marquee was also the longest ever built. Simon Miekeljohn, a sculptor from Hereford, lent us two of his moving sculptures for the Biodynamics part of our feature. He was on site with all his other work, which is earth-inspired and beautiful. One of the permanent gardens created at the show this year so it will live on, this fabulous structure was made by artisan Mark Eveleigh and his partner Gig, complete with a hot tub. Drank far too much of it to keep me awake doing a ten-hour shift each day, but I’m very grateful for all the little independent vans selling good coffee throughout the showground.